Working in emergency medical services is rewarding, but trying to pass the EMT course could be challenging. 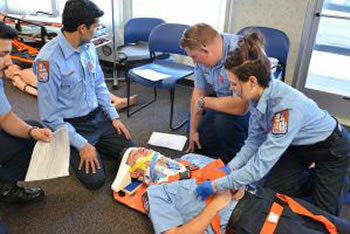 Here are some tips to help you make pass your EMT course. But, no, really. Read the book. And then do the workbook. Falling behind on the reading may happen, but try your best to stay on top of it. Having done the reading will help you feel prepared for class so that you know what questions to ask, where you need additional clarification, etc. Answering questions in the workbook will help you cement the key concepts you just finished reading about. That will be especially beneficial since the workbook questions often cover the same topics that you may see again on a quiz or test. Study your NREMT skill sheets. Practice makes perfect–we all know that. So when you’re practicing skills in class, be sure to refer to your skill sheets and follow along while you or your classmates perform each skill. I also recommend doing writing exercises that challenge you to write down each step of the skill from memory. This will help you practice visualizing the skill sheets and recalling each step quickly–just as you will need to do during your NREMT practical exam. There is A LOT to learn when you’re in EMT school–it seems impossible to know everything. That’s why I can’t stress enough how important it is to not miss any classes. This may seem pretty obvious and true for any class, but I think it’s especially true for EMT school. I had to miss one week of class, and I felt so rusty and really behind because we cover so much in every single class. And, of course, just like reading your textbook, playing catch up is too hard–it’s easier to just avoid falling behind. Feeling confident about your skills and knowledge is so important for establishing competency. If you’re unsure about how to perform a skill or if certain topics aren’t clicking for you, be sure to get that extra attention you need. Think about it. People become EMTs because they like to help people. And EMTs become instructors because they like to help and educate people. Your EMT instructors want you to succeed–don’t be shy about asking them for that extra time practicing skills or for an additional explanation on the difference between an AMI and angina. EMTs have to work closely together. You’re going to be on an ambulance with your partner for 8, 12 or 16 hours in a day. Not only are you going to want to get along, you’re also going to need to be able to work together as an effective team. Start building those relationships in EMT class. Even if you don’t eventually work together, you’ll enjoy class more and have classmates who can help and support you. You can even start a study group before your big test.